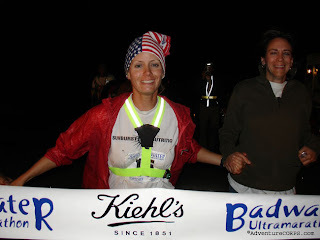 After updating the finish times of the runners that started in the 10am wave, Anita's finish place was 46th overall. Not bad at all considering she was planning to continue to the summit of Mt Whitney and then turnaround and run all the way back to the start. Unfortunately she was forced to abandon the attempted double due to bad weather on Whitney. She reached about 13,000 ft but a bad storm with lightning, hail, rain and 30 degree temps with windchills put an end to the journey. I was finally able to get through on her cell phone this afternoon. She is in good spirits and taking it in stride. And of course she says she will be back and try again next year. She was also happy with the 42:53 finish which was a course pr by about 5 hours. I have never been so scared in my life, up there at 13,600 feet, surrounded by thunder and lightening, and being pelted by hail feeling the temperature dropping. I could see the summit, but the trail was getting iced over, and there was a search and rescue mission later that day, I believe for three people who ignored mother nature. I felt great, too great to give up, but we decided to save ourselves for another race, and it proved to be a wise choice. I could have tried to re-summit, and MIGHT have reached to top on Thursday. MAYBE. If the weather held out. Then I would have had a crappy Badwater double time.The BWD will test you and your crew, put you in pain, and as far as I am concerned, you might as well make all that pain and expenses worth it with a decent time." Way to go! I can only imagine the gut-check required to FINISH Badwater, look up the mountain, refill your bottles, and keep going. Sorry it didn't work out for you this year, but I'm sure you'll do it one day.